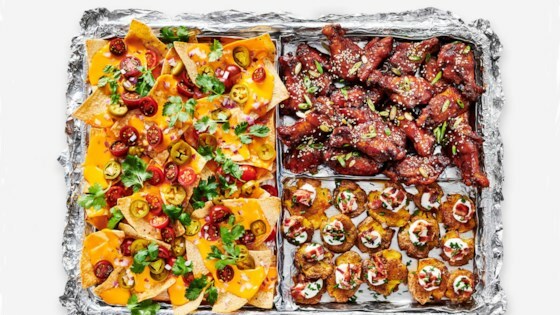 "Treat your family and friends to the ultimate Game Day spread with cheesy nachos, sticky wings and delicious smashed potatoes." Whisk sriracha, soy sauce, sugar, sesame oil, and ginger in a medium bowl until sugar is dissolved. Pour about a third of sauce into a gallon-sized resealable plastic bag and add wings. Seal bag, pressing out air, then toss to coat wings. Chill at least 4 hours and up to 24. Cover remaining sauce and chill. Boil potatoes in a pot of salted water, starting from cold, until fork tender, 15 to 20 minutes. Drain and let cool, then smash with the palm of your hand or the bottom of a glass to flatten gently. Chill until ready to use. Preheat oven to 350 degrees. Line a large rimmed baking sheet with aluminum foil. Build separate foil trays by folding a large piece of foil in half, and folding up the edges to create three trays; one taking up about 1/2 of the sheet to hold the nachos, and 2 smaller trays to hold the wings and smashed potatoes. Remove wings from bag, allowing excess marinade to drip off, and arrange in one of the small foil trays, spacing evenly. Toss smashed potatoes with olive oil in the other small foil tray and season with salt and pepper. Spread out potatoes; place in oven along with wings. Bake until wings are cooked through and tender at the bone, and potatoes are browned on the bottom, 25 to 30 minutes. While wings and potatoes are roasting, cook bacon in a dry medium skillet over medium, turning occasionally, until crispy, 8 to 10 minutes. Drain on paper towels and coarsely chop; set aside. Remove baking sheet from oven and increase temperature to 450 degrees F. Turn potatoes so they're browned-side up and use a brush to baste wings with half of remaining ginger sauce. Arrange 1/2 the tortilla chips on open half of baking sheet. Toss cheeses together and sprinkle half over top of chips. Scatter remaining chips and cheese in a second layer over top. Tent chips with more foil, then place baking sheet back in oven. Bake until cheese is melted and wings are browned and crispy in spots, 5 to 8 minutes. Remove from oven and let cool slightly. Drizzle wings with remaining ginger sauce, then sprinkle with sesame seeds and scallion. Scatter red onion, tomatoes, jalapenos, and cilantro over nachos. Place a dollop of sour cream over each smashed potato, then top with bacon and chives. Season with more salt and pepper and serve. Easy to make and huge crowd pleaser at the Super Bowl!! I made this for super bowl and got lots of compliments.